The double bass player Hugo Rasmussen was here, there and everywhere on the Danish music scene. 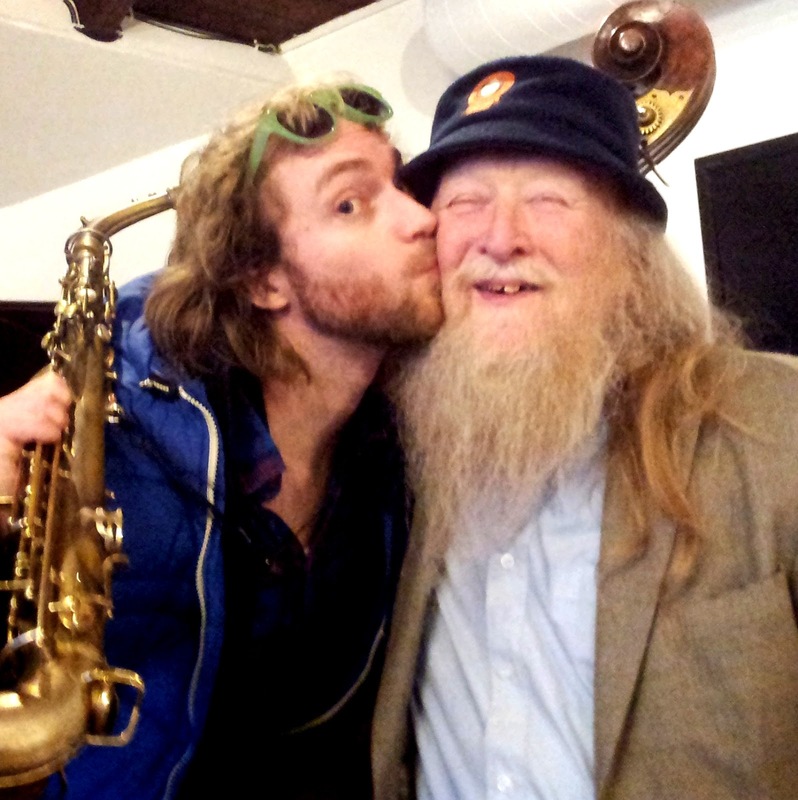 Known as one of the country’s best jazz bass players and entertainers, he embraced all elements of music from Danish Folkelig (‘music of the people’) to performances with international superstars (such as Ben Webster, Dexter Gordon & Tom Waits). After years of poor health this beloved musician and friend is no more. Visiting Hugo in the hospital 10 days before he passed was like hanging backstage at your favourite jazz festival. Old friends, ex-girlfriends, musicians and family were all there, talking about old times, the present and the future. It was just as he loved it: having people around him. Although Hugo was in a good mood (as always) and seemed fine, he was nevertheless weak and had stopped eating. He said 'I have nothing left to give and nothing left outstanding’. He was an active musician until a few weeks before his death, but after living with prostate cancer for years, later spreading to the rest of the body, he was tired and prepared for the end. Everything was taken care of - even the tombstone was already in the making - of course in the shape of a double bass. Hugo was a beloved and admired person and musician and it’s almost impossible to overestimate his importance to Danish music. He loved his bass and his music, and often said 'There's no such thing as bad music, only good music...and that other stuff.' He recorded around 1,000 albums across all genres, did not distinguish between them and loved them equally. His charismatic, warm personality and open mind was a magnet to a lot of people who would instantly love him. He always gave everyone the time of day and a little piece of himself. I think he did this out of love, but also out of curiosity. He was always seeking new ground, appreciated provocative discussion and loved playing with young musicians. 'They are more up for everything, not as stale as my old colleagues', he would say, with a wry smile. Unlike his five years younger bass colleague Niels-Henning Ørsted Pedersen (NHØP), who became an international star, Hugo Rasmussen remained in Denmark, where he had plenty of work. Hugo once told me that in the beginning he tried to sound like the young and talented NHØP, but soon found out that he couldn't and shouldn't. While NHØP's thing was virtuosic soloing, Hugo’s thing was the solid bass backing role which he came to love. For more than half a century, Hugo was admired not only in Denmark but throughout the world for this definitive style of bass playing. I've learned so much from Hugo, and every time I got to play with him it was a great pleasure. Not only would you once and for all learn the correct original voicing or meaning of a song, but also how to best interact with the other musicians and communicate with the audience. He would always give everything he had, even if it was the third gig of the day. After the gig he would often start up a feisty discussion such as who was the best trumpet player ever, followed by loud laughs and big hugs. On my last visit to the hospice, two days before he died, he was very weak. Nevertheless I got the obligatory hug and kiss on the lips. As he closed his eyes I asked him how many songs he might have played in his lifetime and if he had a favourite. He whispered his favourite song and as I sang it to him, he hummed along and smiled with narrow watery eyes – What a Wonderful World. With his strong spirit and musicality he influenced and touched so many people. Although it's with a lump in the throat, his life and music call for a celebration. He enriched many lives and he died as he lived: with humour, love, musicality and a smile on his face. I miss my hero already. It is sad to hear that Hugo Rasmussen will not be amongst us anymore. I have known Hugo in the 1980s, especially when I organised a tour in Holland and Belgium for the trio John Tchicai Marilyn Mazur and Hugo Rasmussen. We stayed in contact for several years. The music world for surely will miss Hugo's contributions. He Always reminded me of two other bass players: Red Mitchell and Peter Ind.